Flowcharts to help you understand your business. ISO 9001:2015 flowcharts created in MS Visio© and SmartDraw©. These flowchart templates can be exported to MS Word©, PowerPoint©, Excel©. 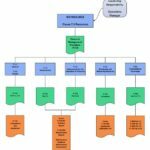 ISO 9001:2015 flowcharts as pdf files so you can view them before deciding on which software you will use to edit the documents. The 7 main flow diagrams provide a summary of the QMS while dealing with the 7 clauses of ISO 9001:2015 and integrating information from the QMS Docs package. The remaining 22 flow diagrams expand on the 7 main ones and deal with understanding what can be done to meet the requirements by providing examples of typical activities and processes.